In the nearly 20-year period that it takes for trees to mature for harvest, the landscape can change, sometimes dramatically. The area around our Windsor Mill is a good example. Domtar owns and manages about 400,000 acres of forestland located near the mill. But that forestland provides only about 15 percent of the fiber the mill needs. In the mid-90s, to meet our growing fiber needs, the mill acquired several plots of fallow farmland in rural southern Quebec. The land was near a road, which offered easy access to the trees that we planted. Over the next 20 years — roughly the amount of time it takes for a newly planted hybrid poplar tree to reach maturity — the area became much more developed, turning a rural plantation into an urban forest. Urban tree harvesting requires good communication with the public. So when our 50-acre plantation near a subdivision in Sherbrooke, the largest city in the region, was ready for harvest in February of this year, Windsor Mill informed the community and explained the mill’s urban tree harvesting practices. The mill began by placing a large sign on the land letting people know about the urban tree harvesting almost a year in advance. It also distributed flyers throughout the neighborhood that explained the tree harvesting process and referred residents to a website for more information. Windsor Mill officials also held meetings with local elected officials and reached out to a local reporter known for his environmental interests to explain the harvest and Domtar’s commitment to sustainable forestry management. Perhaps the public’s favorite bit of news about the urban tree harvesting concerns the mill’s circular economy, which turns waste into nutrients that are returned to the land to grow more trees. 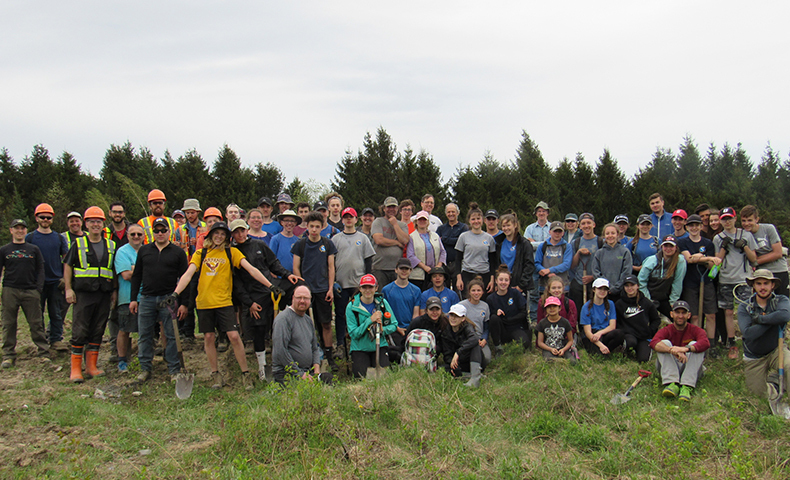 Just two months after the land was fully harvested in March, Domtar worked with 50 local high school students, volunteers and forest workers to replant the area with 15,000 trees in two days. “They appreciate the land is not left bare for very long, and they understand that once replanted, the land won’t be disturbed again for another 15 or 20 years,” explains Cartier.